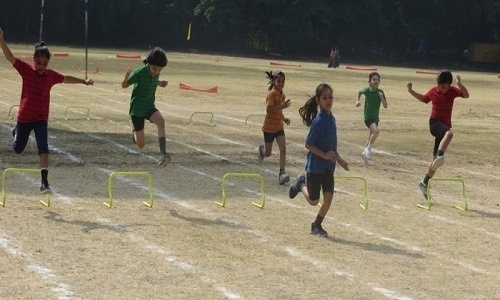 The 35th Annual Athletic Meet of Choithram School washeld on January 3, 4 and 5, 2019 displaying the qualities of sportsmanship and teamwork of students. The chief guests on the opening ceremony were Mr. Rakesh Thakur and Ms. Anuradha Thakur, parents of Aman Thakur of class XI; last year’s best athlete in the junior category. The guests were welcomed by Keshav Gupta, Head Boy and Prinjal Jain, Head Girl of Junior School.The sprawling playground wore a festive look with colourful flags and well laid tracks.The programme started with a well-coordinated marchpast led by the Senior School Head Boy, Senior School Head Girl, Senior School Sports Captain followed by the contingents of four houses viz. Buddha, Gandhi, Tagore and Raman exhibiting their grit to compete in the highest spirit of games. The sports meet was declared open by the chief guests by releasing balloons followed by lighting of torch; the beacon for the games. The flying start was given to the athletic meet by the torch bearers taking a lap of the ground with the torch and lighting the cauldron of the sports meet. An oath, to ensure fair play and true sportsmanship was administered by the Senior School Sports Captain Palkesh Patidar.Mr. Thakur in his speech emphasized to participate in sports and games as they inculcate good habits, confidence and discipline in the students. The combination of Chhattisgarhi dance and musical notes served to motivate the participants to give their best in the Athletic Meet. 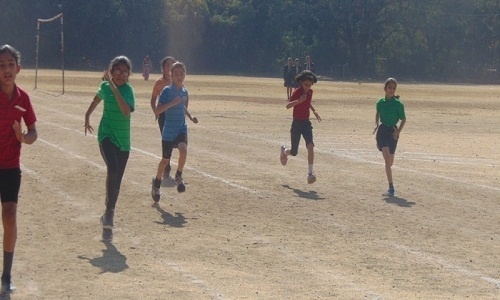 In the post lunch session, students of Junior School competed in various track and field events with zeal and zest. Mrs. and Mr.Sood, parents of Udit Sood of class IX,last year’s best athlete in the sub-junior category were invited as guests to witness the meet. The guests encouraged the participants and appreciated the winners.Vote of thanks was proposed by Junior School Sports Captain Archisha Sikdar. The entire atmosphere reverberated with the echoes of applause of the ebullient and enthusiastic athletes. 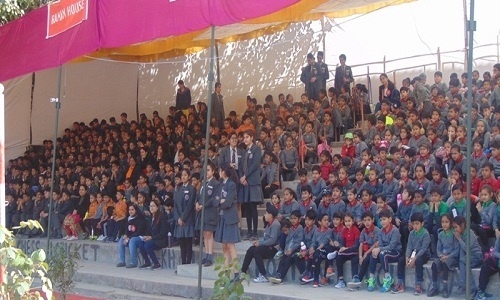 The commentators with their spontaneous narration added flavour by covering the live action of sporting events.The culmination ceremony was heldon January 5, 2019 wherein the chief guests Mrs. and Mr.Khandelwal, parents of Disha Khandelwal of class IX; last year’s best athlete in the junior category witnessed the retreating marchpast followed by the Prize Distribution ceremony.The guests honoured the winners of various events and appreciated the efforts of athletes in setting new records. Adarsh Satwani of Gandhi House, Aman Gangwani and Afifah Patheria of Raman House were declared the individual winners in the Senior category. Disha Khandelwal of Raman House and Yashraj Lalwani of Tagore Housewere the individual winners in junior category.Lavanya Yadav of Buddha House,Rithika Pillaiof Raman House, Ananya Kanadkar of Tagore House and Hardik Bansal of Raman House emerged winners in the sub junior category. 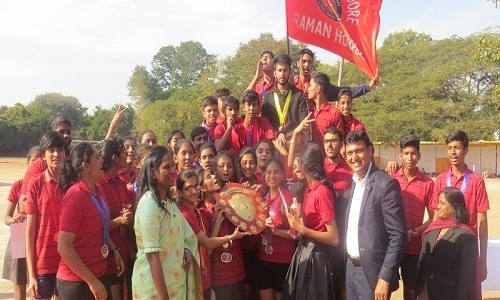 Raman House emerged the overall winner in Senior School while Tagore House notched the top spot in the Junior School. The chief guest Ms. Preeti Khandelwal exhorted the students to believe in themselves and be the best in whatever they do.The Athletic Meet was declared closed by the chief guest by lowering the Olympic flag and handing over the same to the School Principal followed by the vote of thanks proposed by School Sports Captain Palkesh Patidar. Choithram School, ManikBagh organized its 34th Annual Athletic Meet from November 16, 2018 to November 18, 2018. 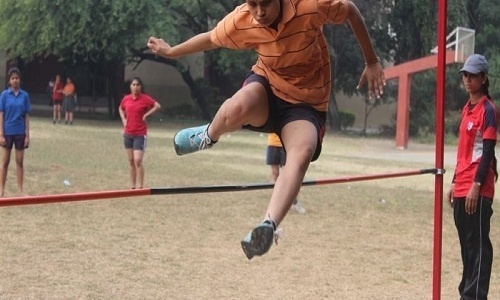 The first day witnessed zestful performance by athletes of classes I to V of the Junior School. Mrs. Khandelwal and Mr. Khandelwal, parents of Disha Khandelwal, last year’s best athlete in sub junior category were the Chief Guests on day one.The Meet commenced with the unfurling of the National Flag and Olympic Flag by the Chief Guest followed by march past by the four house contingents. Torch Relay was also taken around the field by the athletes who notched awards at the international and national level. School Sports Captain Nandini Papriwal administered the oath to the participants urging them to compete with true sportsman spirit. The Chief Guest ignited the Olympic flame edifying the gathering with his thoughtful words and declared the meet open. Mrs. Komal Chhabriya& Mr. Sunil Chhabriya, parents of Saloni Chhabriya of class XI,last year’s best athlete in the junior category were the Chief Guests on day two which witnessed participation of students of classes VI to XII of the Senior School. Mrs. and Mr. Kirti Raj Singh Chouhan, parents of Divya Uday Singh Chouhan of class X,recipient of best athlete award in junior boys’ category last year were the Chief Guests on day three. The culmination ceremony on day three was graced by Mrs. & Mr. Rajesh Papriwal, parents of Nandini Papriwal of class XII, winner of best athlete award in senior girls’ category last year. The guests witnessed the retreating March past and scintillating dance performance. 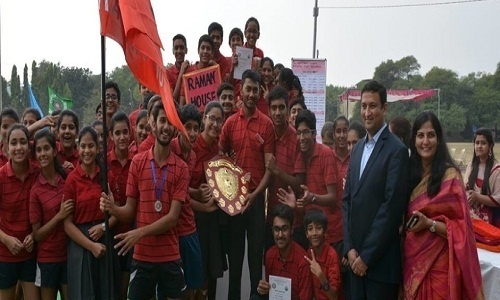 Raman House emerged the overall winner in Senior School while Buddha House bagged the runners up trophy. Buddha House notched the top spot in the Junior School. Nandini Papriwal, Hannah Ochterbeck and Shantanu Shinde were declared the individual winners in the Senior category. In the Junior category the honours were shared by Disha Khandelwaland Aman Thakur. Anishka Rajguru and Udit Sood were the individual winners in the Sub-Juniors category. Mr. Papriwal declared the meet closed by lowering the Olympic and National flags followed by extinguishing of the Olympic flame.The Athletic Meet ended on the note that ‘Sports is all about playing and competing, enjoy it, be positive and try to win.’ Vote of thanks was proposed by Aastha Vijaywargiya, School Head Girl. Choithram School, Manik Bagh conducted its 33rd Annual Athletic Meet from January 10, 2017 to January 13, 2017 following the Olympic theme. Mrs & Mr Kailash Gangrade, grandparents and Mrs Ritu Gangrade, mother of Raghav Gangrade, last year’s best athlete in the senior category, were the Chief Guests. 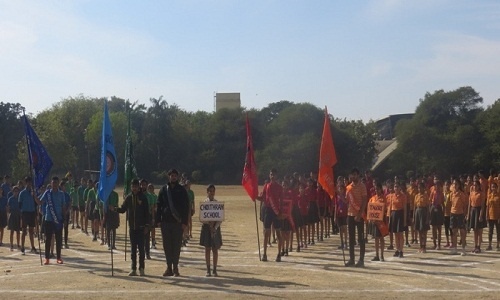 The Meet commenced with the unfurling of the National Flag and Olympic Flag by the Chief Guest followed by march past by the four house contingents. Torch Relay was also taken around the field by the athletes who notched awards at the international and national level. School Sports Captain Raghav, Gangrade administered the oath to the participants urging them to compete with true sportsman spirit. The Chief Guest ignited the Olympic flame edifying the gathering with his thoughtful words and declared the meet open. The first day witnessed zestful performance by athletes of CBSE-i curriculum while athletes of classes I to V of the Junior School participated with zeal on January 11, 2017. Mrs. Khandelwal and Mr. Khandelwal, parents of Disha Khandelwal, last year’s best athlete in sub junior category were the Chief Guests on day two. The teachers’ race added joy to the event on day two. 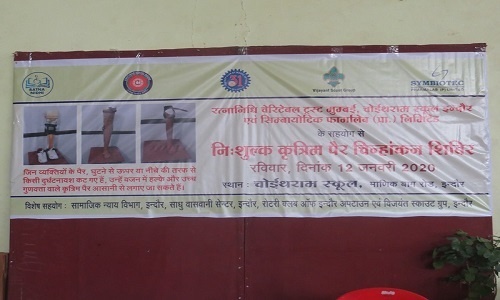 The third and fourth day witnessed participation of Senior School students. Mrs. and Mr. Papriwal, parents of Nandini Papriwal, last year’s best athlete in the junior category were the Chief Guests on day three. Mr. Uttam Kumar Jha, Principal Choithram School, North Campus was the Chief Guest on January 13, 2017 for the culmination ceremony. 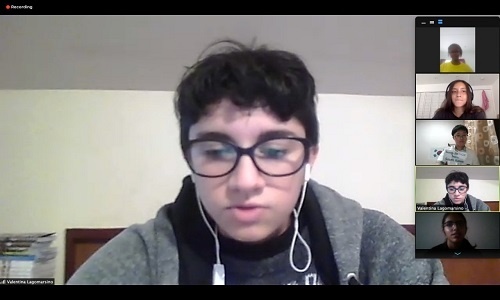 He congratulated the winners and inspired everyone by saying that participation is more important than winning. 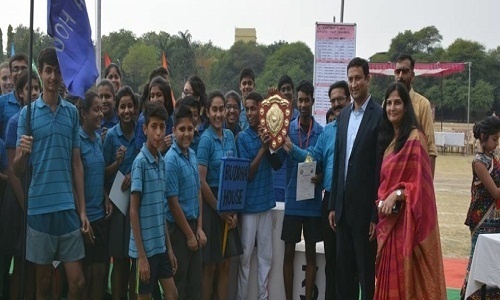 Gandhi House emerged the overall winner in Senior School while Buddha House notched the top spot in the Junior School. Nandini Papriwal and Raghav Gangrade were declared the individual winners in the Senior category. In the Junior category the honours were shared by Saloni Chhabriya and Divyauday Singh. Disha Khandelwal and Samyak Jain were the individual winners in the Sub-Juniors category. Mr. Jha declared the meet closed by lowering the Olympic and National flags followed by extinguishing of the Olympic flame. 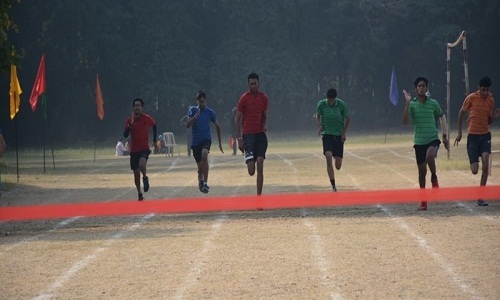 The school hosted 32nd Annual Athletic Meet from January 16 to January 20, 2016 to channelize the youthful exuberance and energy of students. Mrs. & Mr. Rajeshi Papriwal, parents of Nandini Papriwal, last year’s Best Athlete in the Junior Category were the Chief Guests at the inaugural ceremony on January 16, 2016. The Meet commenced with the unfurling of the National Flag and Olympic Flag by the Chief Guest and march past by the four contingents. School Sports Captain Sanjana Rathi administered the oath to the participants urging them to compete with true sportsman spirit. The Chief Guest ignited the Olympic flame edifying the gathering with his thoughtful words and declared the meet open. The first day witnessed zestful performance by athletes of CBSE-i curriculum while the athletes of classes I to V of the Junior School participated with zeal on January 18, 2016. A group of 29 students of classes VII and VIII of Delhi Public School, Srinagar who are visiting the school on an inter-cultural exchange programme also participated in various events on January 19 & 20, 2016. The Chief Guests of the closing ceremony on January 20, 2016 were Mrs. & Mr. Nimgaonkar, parents of Lovina Nimgaonkar, last year’s best athlete in the Senior Category. Retreating march past was followed by lowering of the Olympic and National flags followed by extinguishing of the Olympic flame. Mr. Nimgaonkar appreciated the hard work, spirit and strength of the athletes and declared the meet closed. 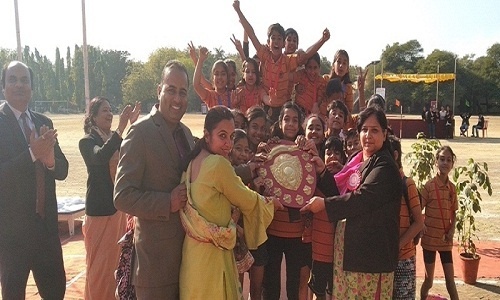 Gandhi House emerged the overall winner in Senior School while Raman House notched the top spot in the Junior School. Lovina Nimgaonkar, Raghav Gangrade and Abir Qureshi were declared the individual winners in the Senior category. In the Junior category the honours were shared by Saurish Phatak and Nandini Papriwal. 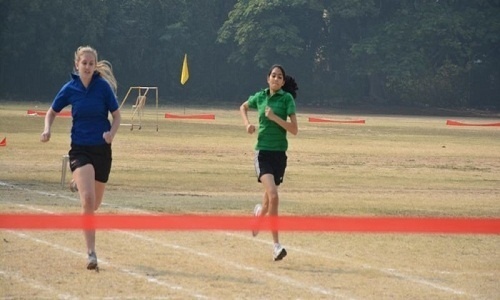 Divya Uday and Disha Khandelwal were the individual winners in the Sub-Juniors category. 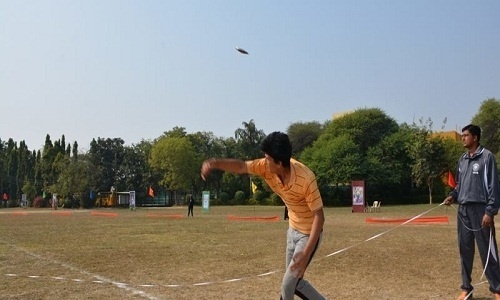 31st Annual Athletic Meet of Choithram School, Manik Bagh was organized from January 15 to 27, 2015 amidst great fanfare and gaiety. Mrs. & Mr. Hardeep Singh Chawla, parents of Karman Chawla, last year’s Best Athlete in the Sub Junior Category were the Chief Guests at the inaugural ceremony on January 15, 2015. The programme commenced with the school flag being unfurled by the Chief Guest and march past by the four house contingents. School Sports Captain Tanisha Rashinkar administered the oath to the participants urging them to compete with true sportsman spirit. The sonorous melody of the musical composition by the tiny tots of classes I and II enthused sportsman spirit among the young athletes. After edifying the gathering with his thoughtful words, the Chief Guest declared the meet open. 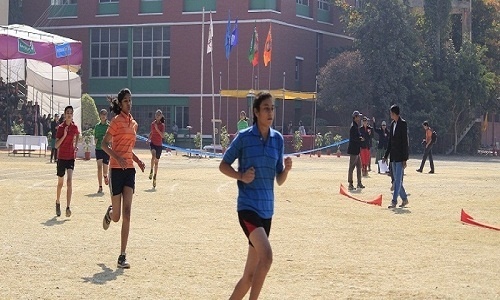 The first day witnessed zealous and zestful performance by athletes of classes I to V while class VI to XII athletes competed enthusiastically on the second and third day. 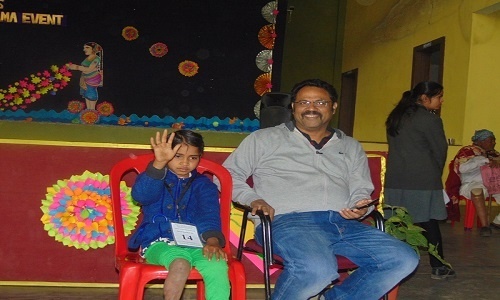 Mrs. & Mr. Govind Rathi and Mrs. & Mr. Dinesh Dangi, parents of Sanjana Rathi and Rachit Raj Dangi, last year’s Best Athletes in the Junior Category were the Chief Guests on the second day and at the closing ceremony on January 16 & 17, 2015 respectively. Buddha House emerged the overall winner in Senior Wing while Gandhi House notched the top spot in the Junior Wing. Lovina Nimgaonkar and Sankalp Solanki were declared the individual winners in the Senior category. In the Junior category the honours were shared by Raghav Gangrade and Nandini Papriwal. Himanshu Vaswani and Saloni Chhabria were the individual winners in the Sub-Juniors category. Retreating march past was followed by lowering of the school flag by the Chief Guest. The Chief Guest then enthralled the audience with his inspiring words and declared the meet closed. menced with the school flag being unfurled by the Chief Guest and march past by the four house contingents. School Prefect Mehak Yadav administered the oath to the participants urging them to compete with true sportsman spirit. The sonorous melody of the musical composition by the school choir was followed by a reverberating dance presentation by junior school girls. After edifying the gathering with his thoughtful words, the Chief Guest declared the meet open. The first day witnessed zealous and zestful performance by athletes of classes I to V while VI to XII athletes competed enthusiastically on the second and third day. Mr. Manoj Singh Bhati, father of Mahima Bhati, last year’s Best Athlete, was the Chief Guest at the closing ceremony on January 23, 2013 while his wife Mrs. Babita Bhati was the guest of honour. Gandhi House emerged the overall winner in Senior Wing while Buddha House notched the top spot in the Junior Wing. Mahima Bhati and Ravi Choudhary were declared the individual winners in the Senior category. In the Junior category the honours were shared by Sanjana Rathi and Rachit Raj Dangi while Karman Chawla and Manav Mulchandani were the individual winners in the Sub-Juniors category. Two new school records were set in the athletic meet viz., Saurish Pathak of Buddha House set the record in 100 m sprint in the sub-junior boys’ category by clocking 12.6 seconds while Yash Mukati of Tagore House set the record in long jump in the senior boys’ category by covering 5.87 m.